There are things you just can’t make up, and it seems there are more and more of them every day. 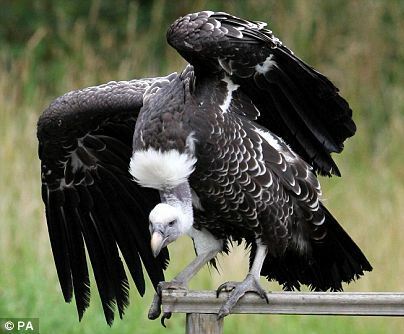 The headline on Drudge said, Vulture tagged by Israeli scientists flies into Saudi Arabia — arrested for being a spy! I passed on two other absurd headlines — “Alec Baldwin ‘very, very interested’ in running for office…” and “Michele Bachmann considering presidential bid…”. But I couldn’t resist the vulture spy headline, partly because it was more realistic than the other two. Last month a politician in Egypt suggested that the deadly shark that killed and maimed multiple tourist may have been sent by Mossad. The animal could have been, the Sinai regional governor claimed, an Israeli agent. “What is being said about the Mossad throwing the deadly shark in the sea to hit tourism in Egypt is not out of the question. But it needs time to confirm,” Mohamed Abdel Fadil Shousha said at the time. You got to admit, those sharp Arabs don’t miss much! Control: BS27, this is control. Report. Over. Control: Roger, BS27, understand you have nothing to report. What about that papa charlie [perished camel] you reported earlier — the one we saw on your video link? Over. Control: Roger, understand it’s just a papa charlie. We want to confirm if it was carrying weapons. Over. BS27: Qwark! Kluggh! Mugla? Grrgle! Control: BS27, there’s no danger in landing. No living things with 350 miles — remember, this is Saudi Arabia. Just land and check the papa charlie for weapons. And, yes, you can have lunch while you’re doing it if you must. Over. BS27: Hackkh! Irrgh! Humkha! Humkha! Brglok? Grrgle! Control: BS27, a Saudi fighter jet is circling you? OK, just keep calm. That’s a higher-priority collection objective than the papa charlie. See if you can get close enough to see what kind of fighter it is and what weapons it’s equipped with. Over. BS27: Brglok? Klogl! Humgra! Humgra! Grrgle! Control: BS27, just do it. Hit the afterburner on your jetpack and you’ll be able to catch him. And stop bitching about scorched tail feathers — they’ll grow back. Over. Bs27: Qwark! Humkha! Kerbrbl! Mugla? Grrgle! Control: BS27, we saw it all on your video link. He crashed right into the desert! Return to base, BS27. Yes, you can have lunch when you get back. There’s some roadkill on the highway. Out. Control: Mossad 6, this is Control. Over. Mossad 6: Roger, Control. Report. Over. Control: BS27 completed his mission and he’s returning to base. One papa charlie sighted but not investigated because a Saudi fighter came on the scene. BS27 went into afterburner and flew alongside the fighter. We got great video. It looked like it was prayer time because the Saudi pilot had his boots off and his feet on the instrument panel, trying to wash them. Must have hit the controls because the fighter rolled over, went into an inverted flat spin, and crashed in the desert. Over. Mossad 6: Great! Four more and BS27 will be an ace! [Chuckles in the background] Over. Control: Yeah, right. If he has any tail feathers left. Over. Mossad 6: Good report, Control. Got to go — we’re having trouble with the communications link to the shark in President Mubarak’s swimming pool. Out. Perhaps we can learn something from Saudi Arabia’s counter espionage program. We just need to start thinking outside the box. They probably have files on animal intelligence as well as human intelligence. This is leading edge stuff!!!! Thanks, Brianna. Great videos! Like all good satire, there are big chunks of truth in everything they say.